To access Conference Documents, click HERE. To view full PROGRAM and SPEAKER INFORMATION click HERE. BACKGROUND: As the healthcare landscape continues to change and complexity increases, new ways of leading become the imperative. Given the importance of leadership and the executive’s role in navigating today’s complex systems, Architects of the Future brings together nurse executives from organizations across the country to work together to see the world anew by refocusing the lens through which leadership is viewed. Leadership requires expanding the capability of people within the organization to face and adapt to continuous change and complexity. This focus starts with building the capability of the leader him/herself and then moves to creating the context within which others can be successful and align their actions to the vision. 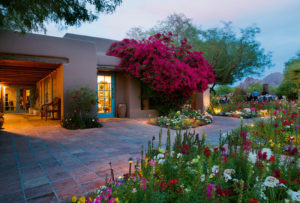 The unique, intimate setting of the Hermosa Inn will provide opportunities to hear lessons-learned from seasoned CNO’s and problem solve with colleagues as you design your own targeted action plan to get you and your organization to the next level. Reassess, retool and refine results for success in this magnificent, reflective environment. Ongoing leadership coaching and networking opportunities. Conference registration fee: $1250. You may pay using Pay Pal link on the registration form, or scan and email a Purchase Order to Rory Gilbert, or mail a check or Purchase Order to Thunderbird Leadership Consulting, 2211 E. Palmaire, Phoenix, AZ, 85020. Click HERE to make your room reservation at the Hermosa Inn.